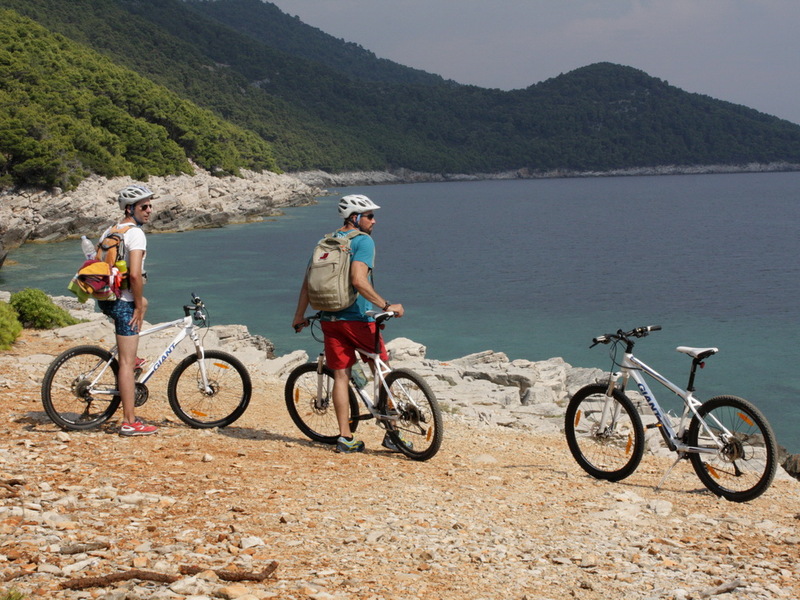 Sail around the Elaphiti Islands, Mljet Island National Park and Dubrovnik actively with cycling, kayaking, cliff jumping and swimming. Enjoy accommodation aboard the catamaran and sea food prepared by local, family owned restaurants. 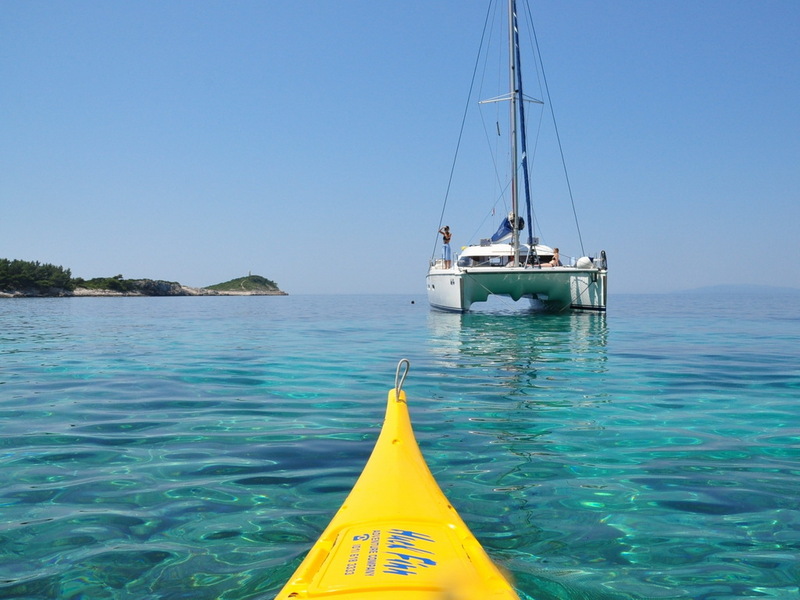 Adventure Sailing holiday isn't just a sailing trip or adventure package. It has been designed for those who love being active outdoors, who admire art and history and appreciate ancient architecture and local tradition. Daily activities are rather short and not too demanding. Dubrovnik, the Elaphiti shorelines and Mljet Island National Park are rich in history and natural variety - cliffs, caves, coves, rocks, beaches, pine forests... We will explore them while sailing on a yacht, sea kayaking, paddleboarding, cycling, swimming, snorkeling and on foot. Lopud, Koločep and Šipan belong to the Elaphiti Islands archipelago – these are some of Croatia's most beautiful green islands covered by forests with lots of sunshine and sandy beaches, free of traffic, and under an hour’s sailing time from Dubrovnik. Our yachts or kayaks are occasionally escorted by friendly dolphins or tuna that are often seen in the area. The sea is blue, clear, warm and friendly. 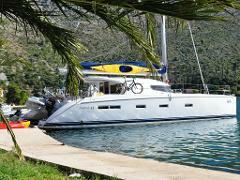 Accommodation: Our boats are Nautitech 44 catamarans, each with four cabins with en-suite bathrooms. Each boat has three double cabins and one that can be used as a twin/triple. Gourmet Experience: Occasionally, excellent local and private restaurants will be available during lunchtime and dinner. 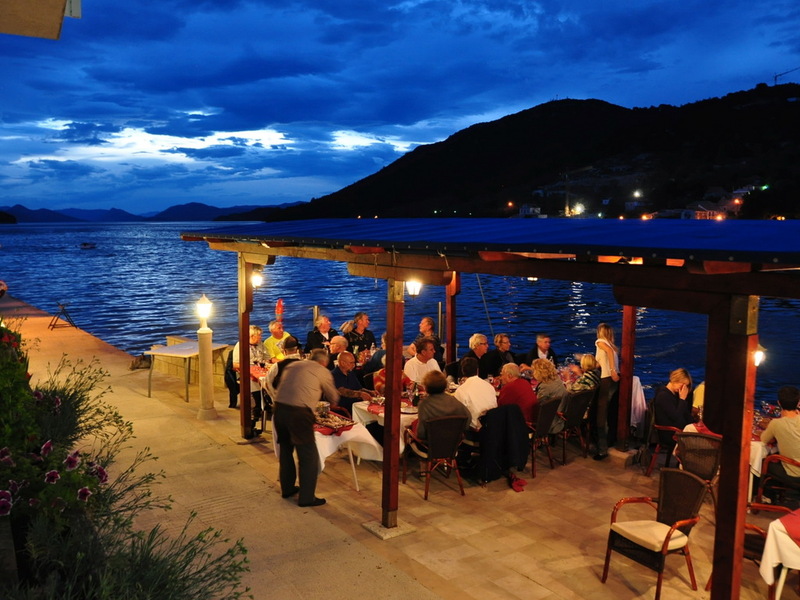 They have received excellent feedback from previous guests for their value for money and we strongly recommend trying their specialties to all those interested in discovering authentic Croatian food. The skipper will be happy to make reservations and give suggestions. Single use rooms/cabins are available upon request with a 25% surcharge. Sharing a twin room with another person is possible. * Option: Additional nights on Sipan Island may be booked. Arrival at the Huck Finn base in Komolac and boarding at 10 am. The guests are welcomed on board by their crew and we sail out after short safety instructions. 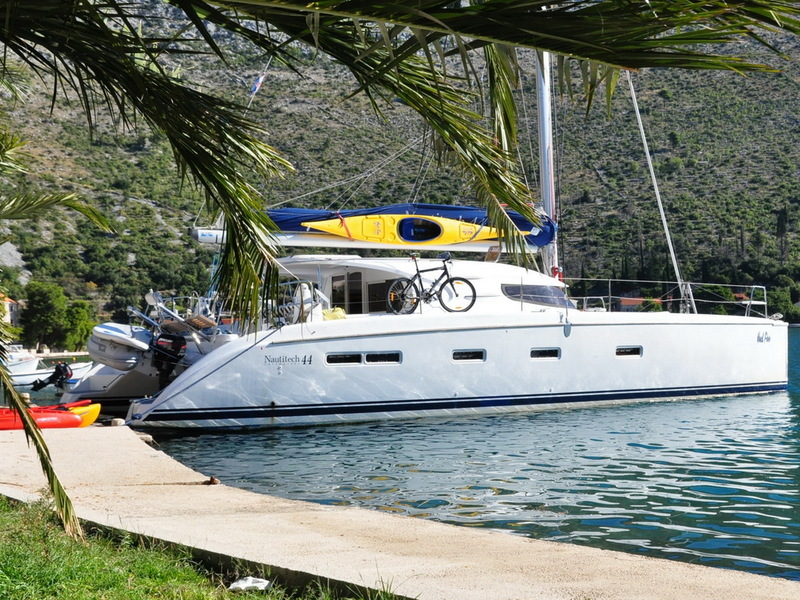 Our yacht is a modern catamaran for up to 10 passengers with a lot of deck space, comfort, and very good sailing performance. Our first stop today is Kolocep island – the smallest of the inhabited islands in the Elaphiti Archipelago. 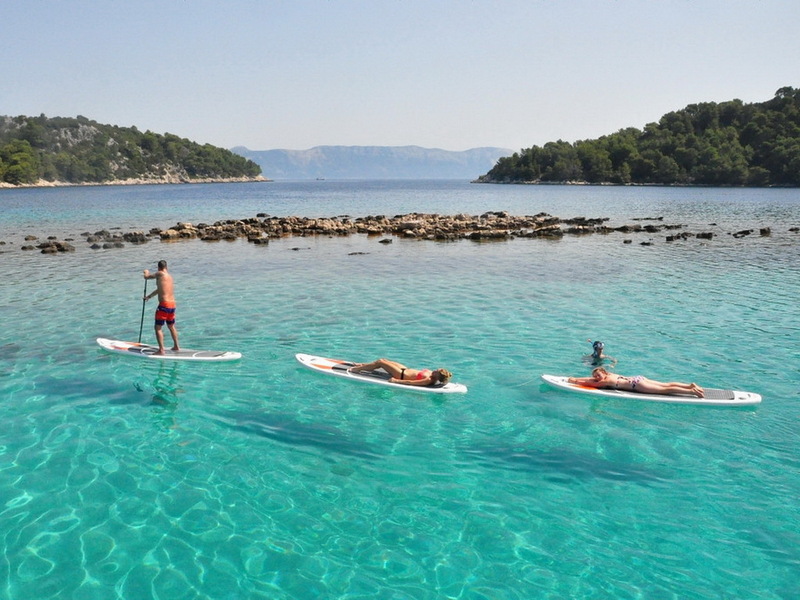 Kolocep is ideal for water activities and we will try out paddleboards and make a swimming break before stopping for lunch in one of the best fish restaurants in the area. After lunch and a short hike to Kolocep’s spectacular cliffs, we continue sailing towards Lopud and Sipan islands. 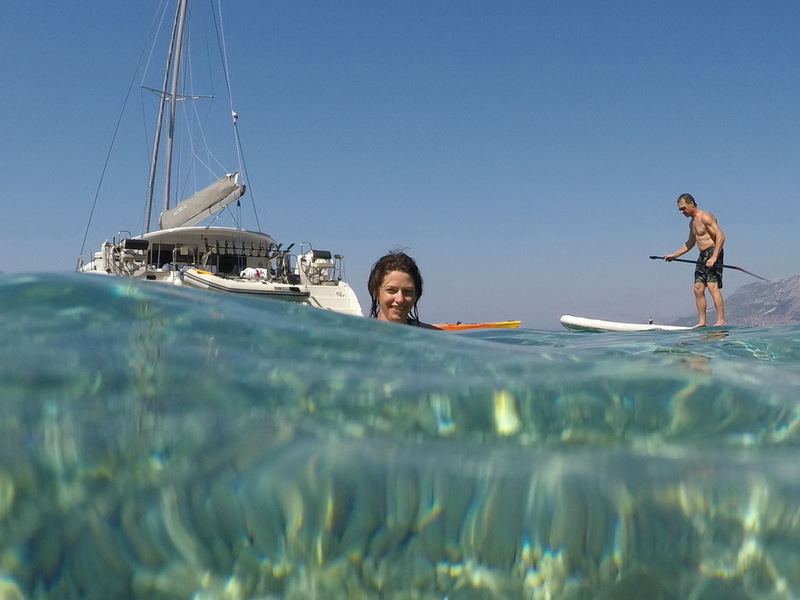 We will anchor in one of the most beautiful bays of the area for a dinner and a swim. 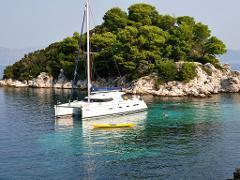 We leave Sipan behind early today and sail out towards Mljet Island National Park. 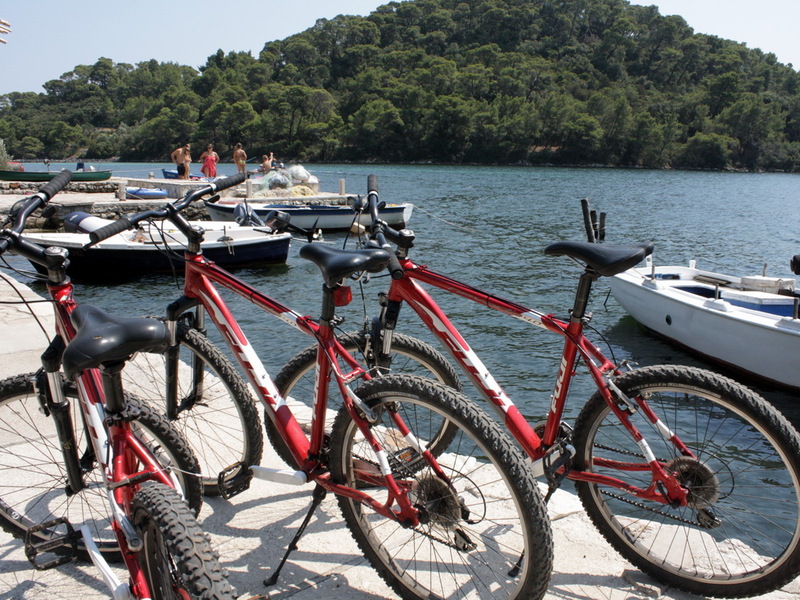 Two saltwater lakes surrounded by a lush, green forest, the larger one with a small island in the middle, make Mljet a spectacular location for kayaking, paddleboarding, hiking, cycling and swimming. You can choose to cycle from the catamaran to the lakes, where you can take a boat to the small island with a 12th-century Benedictine monastery. Entrance fee to the national park is not included but can be paid on spot. 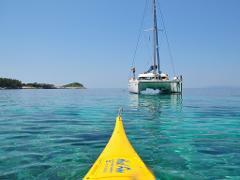 In the late afternoon, we will sail towards the Peljesac Peninsula and anchor in a quiet bay near Zuljana Village. Today we spend the day exploring the Peljesac Peninsula, one of the most successful and famous winemaking regions in Croatia. It is a true oasis of peace with its vast vineyards, salt and oyster farms, quiet towns, narrow streets and hidden beaches. We will spend the morning paddling, snorkeling and swimming in Zuljana Bay. Afterward, we sail east towards Broce and Ston. 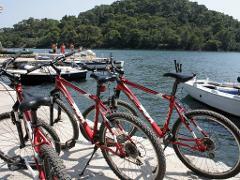 Cycle to Ston, a lovely old town unspoiled by tourism, with pleasant cafes and restaurants. Take the time to explore the Ston city walls, salt farms, or taste its famous oysters or mussels before returning to Broce for the evening. This morning we sail out of Broce and continue sailing east between the Elaphiti Islands until we reach Komolac again. Disembark around noon. Relax in Komolac, enjoy lunch at a local restaurant or continue to your next destination. If you decide to spend more time in Croatia, our guides will be happy to recommend other beautiful places to visit – especially those you won’t find in tourist guidebooks.